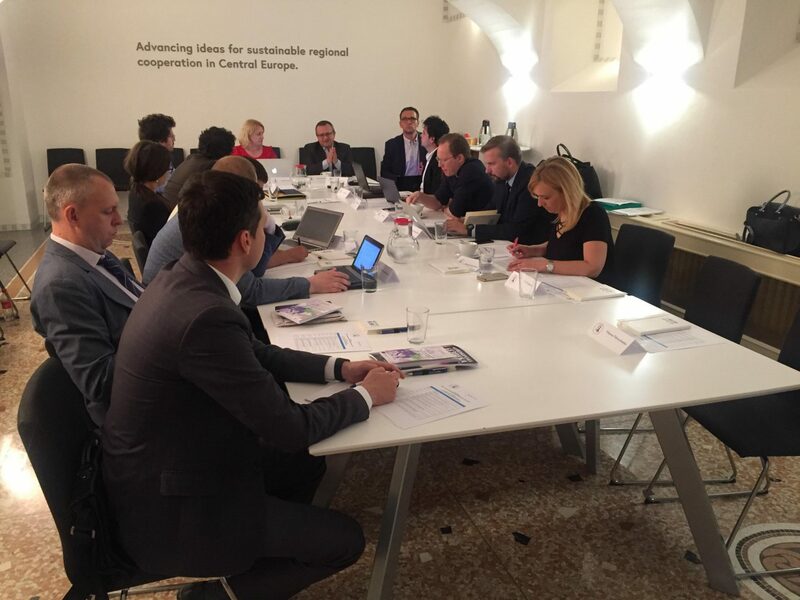 The roundtable meeting “Energy crisis management: decision-makers and civil society” was held on May 24, 2018 in the office of International Visegrad Fund. It was the second workshop in the project “Energy security and effective strategic communication the civil and governmental actors: V4+Ukraine” supported by International Visegrad Fund. During the event experts from Czech Republic, Hungary, Slovakia, Ukraine, and Poland presented the cross-country evaluation of the results of deep interviews they have conducted with decision-makers and stakeholders in their states. Also, participants of project from Slovakia and Poland introduced the structure of energy crisis communication in their countries. Additionally, participants discussed launch of a platform of energy crisis communication between experts and issues of information policy. Experts have suggested that we are lacking a communication on the international level. There is a need to develop standards of communication which would be checked through training and simulations of emergency situations. Dr. Samuel Goda, research fellow of the Slovak Foreign Policy Association and vice-dean at the Faculty of International Relations, University of Economics in Bratislava, stressed that in the case of Slovak Republic, besides the formal structures of crisis management, informal relations between governmental, business and think-tank representatives work very well which makes the overall communication more flexible and faster. Debating the results of interview with Polish respondents, Michaela Karaskova, the President of KNO Czeska, underlined that “Polish government needs to set a regular small workgroups’ meetings with energy experts, not only meeting on conferences, and to develop the official channel of communication with expert communities. Additionally, Polish state agencies should be more proactive and more open to different types of communication”. The results of interview with Slovak experts were evaluated by Ukrainian partners. In the conclusion, Vitalii Martyniuk, expert from Center for Global Studies Strategy XXI, stated: “There is very good internal communication in the energy field of the Slovak Republic, but reaching an effective strategic communication on the international level is difficult because everyone competes for market share. Regional communication is also good due to V4 and the EU formats”. Hungarian expert Andras Jenei from Center for Fair Political Analysis added that “In case of an energy crisis and particularly in the event of a security of supply problem, the V4 states’ could agree to show solidarity on an institutional level with Ukraine, as three members of V4 are the only physical suppliers of natural gas to Ukraine from the West. This would be a big step from the ad hoc and in situ voluntary solidarity that we are experiencing presently. At the same time, Visegrad Group should consider a possibility of creating an working group of experts from member states to examine the transition of system in Ukraine and provide policy and technical assessments, and priority lists to Visegrad Group’s countries’ governments and TSO’s to increase gas crisis preparedness”. Experts have indicated a necessity to establish standards for strategic communication that will be verified via drills and crisis situations’ simulations. During the roundtable, a need for a regional reporting on energy situation was raised – the cooperation on this issue between governments would improve cooperation and overall energy security in the region. The meeting was the second event of the project that will allow to organize comprehensive simulation of the energy crisis that will take place during Warsaw Security Forum 2018 conference in October 2018.